." This included my father, Digant Oza. 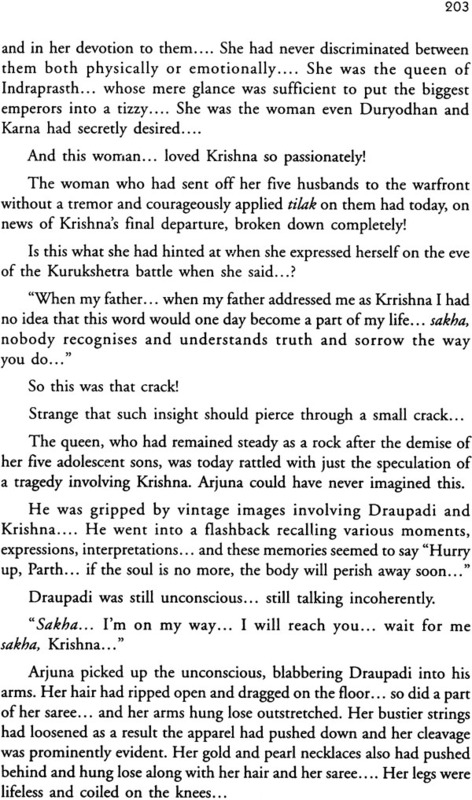 And yet, ironical as it is, the Krishna I have always been looking for, I discovered in this book. This can probably be because I have never revered Krishna as a Lord. At best, I would describe him as an awesome personality. Born 20,000 years ago, if that really happened, he is the biggest miracle of life. In Mahabharata, he is portrayed as a politician; in the Bhagawat, He is the Lord. In Gita, he is the guru, the fountainhead of knowledge. His association with Draupadi so many centuries ago is an ideal example of man-woman friendship. With Rukmini, his spouse, it was an equal reciprocation of love and respect; and with Radha, his attachment was so pure and intense that even today so many years later, we go beyond the society norms and revere 'Radha Krishna' as deities. Undisputedly he was an overwhelming persona, but at the end of the day, an individual. Then why cannot we as ordinary mortals perceive and relate to him as a human being?
. or rather his purity and divinity prevail in our lives guarding the entire Universe.
? These questions have often nagged me.
. 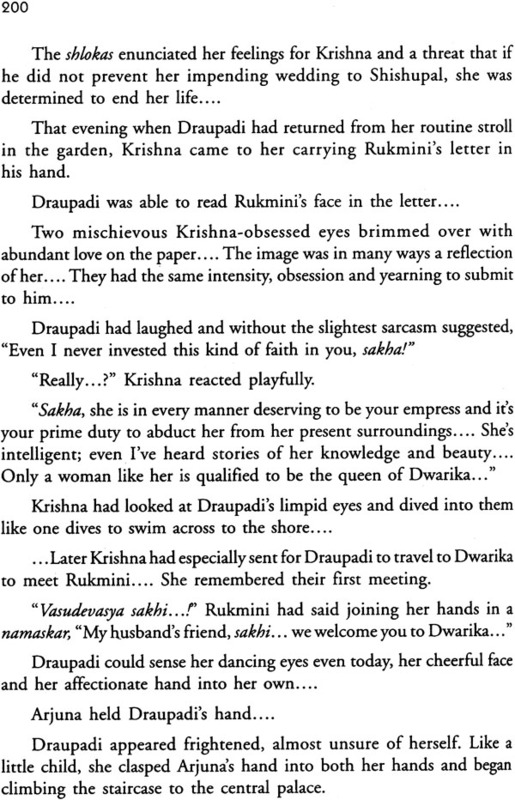 I have always been curious to know what these women thought about Krishna, what did they feel for him? It is about his relationship with all these four women. 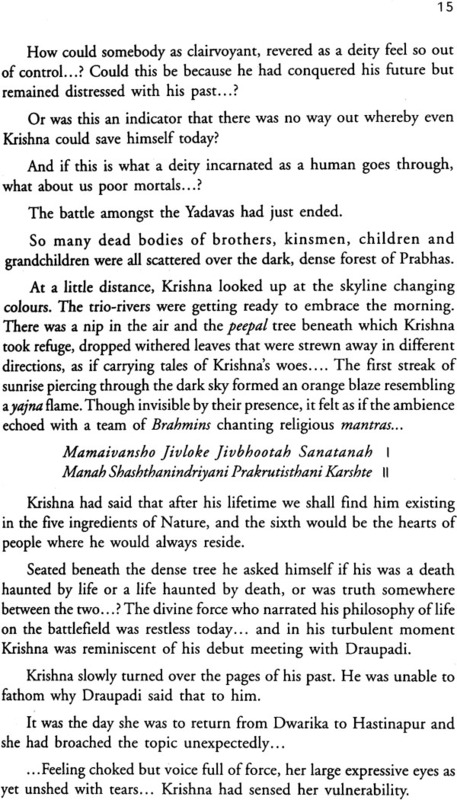 For me Krishnaayan  The God Who Lived as Man is his introspection during those last moments. 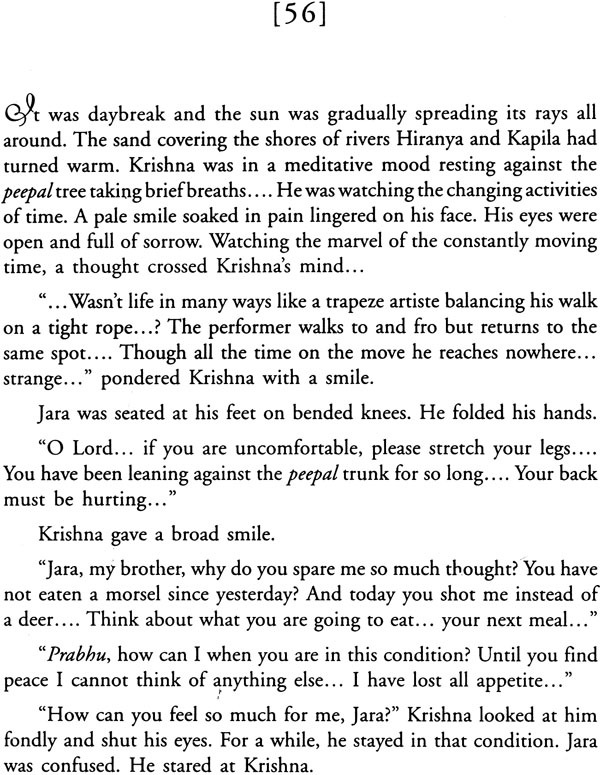 This is a story out of my imagination, my attachment for Krishna. It is my perception of his final moments! 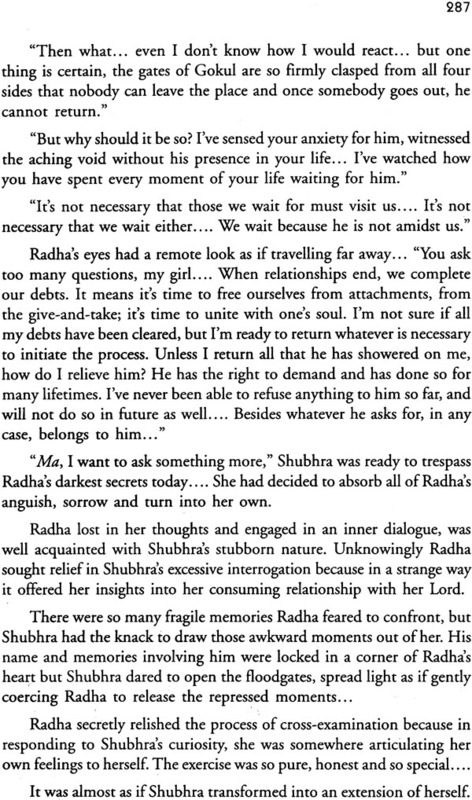 In moments of conflict, I have preferred to look inside my heart for answers; so in a way, I'm Draupadi, Rukmini, Radha or Satyabhama of this story. 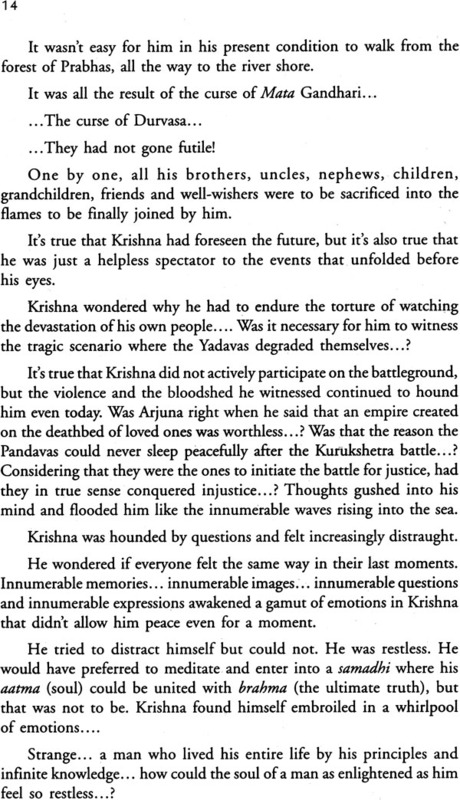 Perhaps it is my undying passion to make Krishna a part of my life that has made this book possible. It is my offering to the Lord that I share with his innumerable devotees. So here's presenting a contemporary Krishna, somebody you can meet over a cup of coffee or bump into your daily routine. He is neither a yogi, nor a guru, and definitely not a miracle worker. He could be somebody who would stroll beside you at your morning walk and casually relieve you of your self-doubts. He is a friend you can use as a sounding board without fear of being judgemental of you. Offer him anything sincerely, and he accepts it without questions! In any case, isn't what we offer him all that he has granted us in the first place? Twadiyam Vastu Govind Tubhyamev Samarpyate! For years he was just an idol in our temple at home whom mother woke up every morning with a flame and a clanging bell. Sometimes when she was occupied in her domestic chores, one of us sisters was instructed to follow the ritual which we did but we could somehow never match her fervour or her devotion for him. The first time I struck an independent equation with Krishna was as a teenager when I was enrolled in Bharat Natyam dance lessons. In the five-year-long course of learning the art from, my colleagues and I were trained to sing paeans to the Lord and enact all the naayikas in his life  his mother, beloved, sakhi so much so that all of us unknowingly fell in love with him. 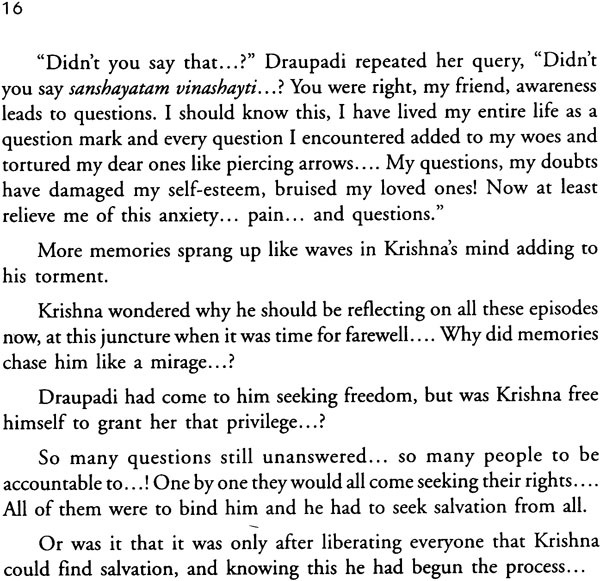 The reason I was attracted to translating Krishnaayan from Gujarati into English was because it explores Krishna as a man rather than as a God. Lord Krishna is the most charismatic God of Hindu pantheon who was blessed with a boon to recreate his life in his last moments. 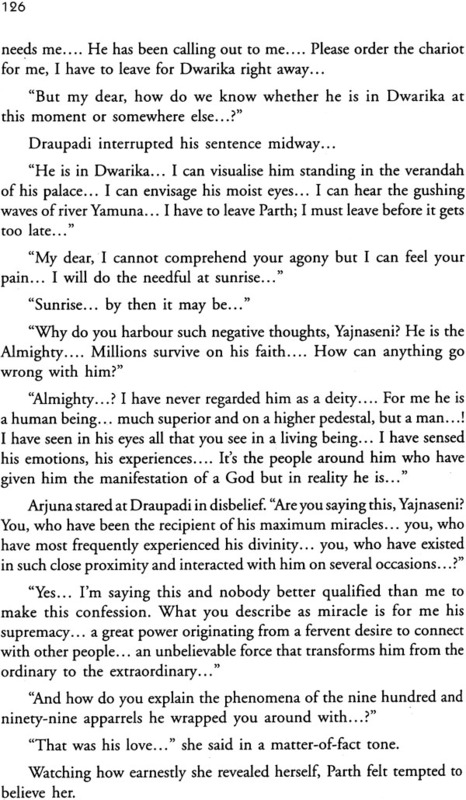 After the torturous Yadava yatra to Somnath where Krishna witness the devastation of his entire lineage, he arrives with a bleeding foot to Prabhas Kshetra. 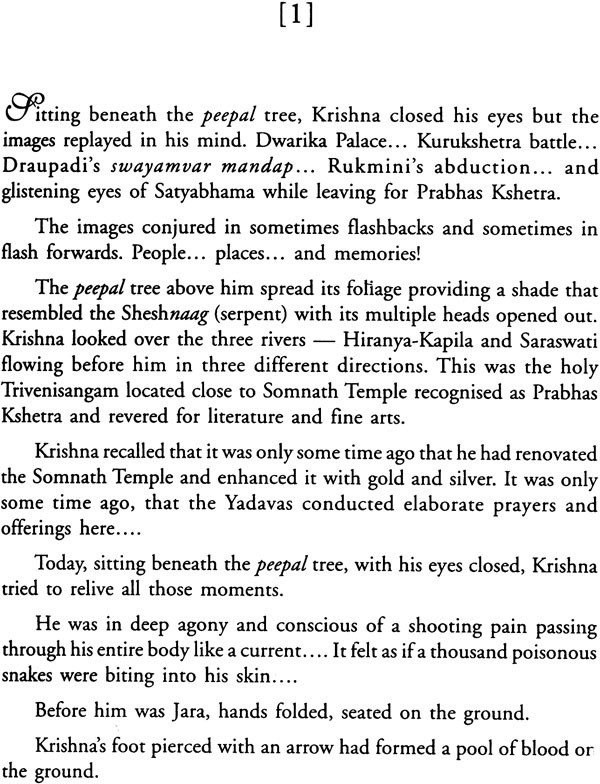 It is here resting beneath a peepal tree before the river Trivenisangam that Krishna reflects on the four most important relationships in his life  his wives (Rukmini and Satyabhama), beloved (Radha) and friend (Draupadi). Four contrasting personalities but bonded in a magnificent obsession, Krishna. Borrowing from the fable but original in structure and content, the book is fictional and a chronicle of man-woman equations. 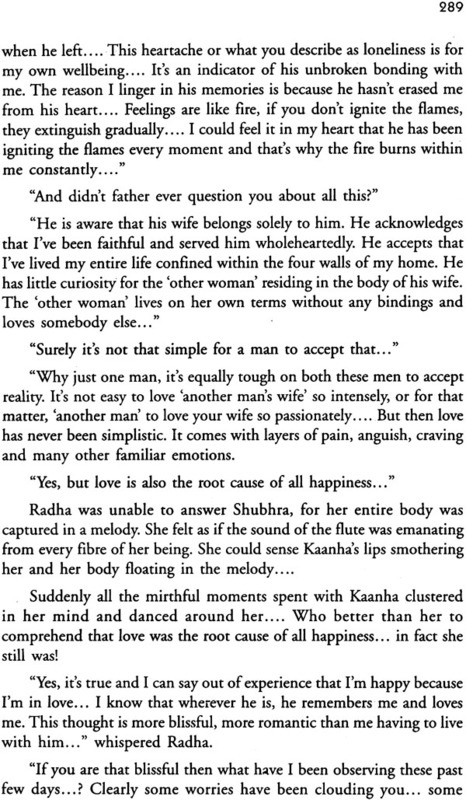 Did Krishna love these woman as much as they loved him? Did he desire and yearn for them as much as they yearned for him? Who out of these four women was closest to his heart? Whom did he feel most secure with? Did he sometimes, unknowingly discriminate one against the other or was he able to grant all of them equal justice always? Did the four women ever fantasise trading places with one another, only to scrutinize what went on in their beloved's mind? .? 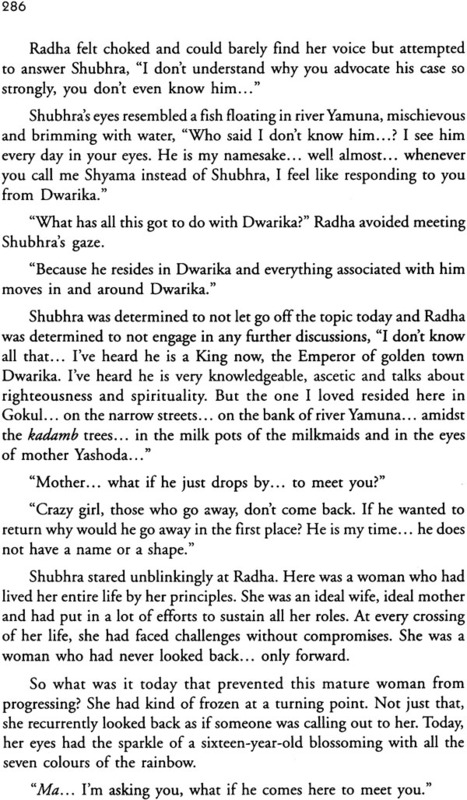 Would Krishna have been drawn to these women had he encountered them in different circumstances and surroundings? 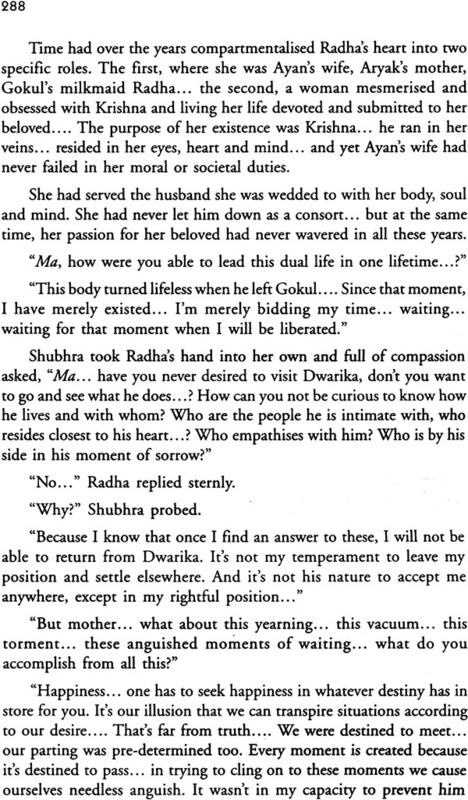 Born in Mathura, reared in Gokul, ruled in Dwarika, was he content with the flow of his life or did he secretly desire another life and a destiny for himself? This is not the love story of Krishna or any one God. It is the story of every charismatic individual in contemporary times who dared to love many and was in return clamoured by several. It is the story of any arresting and sensitive person, intensely involved with his life.
. And that includes both the Supreme Entity and us ordinary mortals. Krishna  The God Who Lived as Man is one such story of passion and pain. Bhawana Somaaya began her career in journalism in the late 70s while studying for her BA degree in Psychology. Commencing with Free Press Journal's Cinema Journal as chief reporter, she moved to Super as a special correspondent while completing LLB at the Government Law College, Mumbai. In '81 she joined Movies as an assistant editor and was promoted in '85 as its joint editor. In '89 Chitralekha asked her to launch their first English publication and in 2000 she joined as editor Screen, a film weakly of the Indian Express group. She is the recipient of several prestigious awards and has contributed columns to Sunday Observer, Afternoon, Janmabhoomi, Pravasi, Hindustan Times, The Hindu, The Pioneer and Newstime. She has written seven books on the subject of show business, Amitabh Bachchan  The Legend, Salaam Bollywood. Takes-25, The story so for, Cinema: Images and Issues, Hema Malini  The Authorised Biography and finally Fragmented Frames. 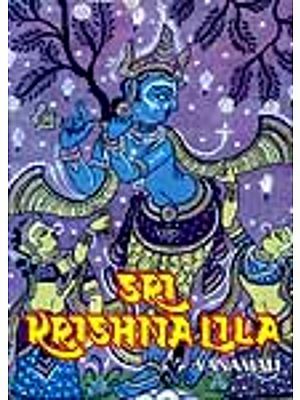 Krishna  The God Who Lived as Man is Bhawana's eighth book and her first attempt in fiction and transcreation. Kaajal Oza-Vaidya is a distinguished name in Gujarati writing. Who has dabbled in all forms of performing media, which include journalism, theatre and television. She has to her credit seven plays Saavka, Guru Brahma, Pitrudosh, Ashwamedh, The Perfect Husband, Chung Ching, and Doctor, Tame Pan!
. To Akash, and a collection of poems named Shesh Yatra, Kaajal has authored several novels, such as, Chhal 1-2, Maunraag, Yog Viyog 1-2-3, Parijat No Parodh, Pot Potani Pankhar 1-2, Lilu Sagpan Lohi Nu, Tera Chehra Ni Lago Lag, Madhya Bindu, Krishnaayan, Search Light, Vehli Aastha, Tera Vinana Saherma and Ek Sanjna Surname. Krishna  The god Who Lived as Man is the English Translation of Kaajal's original Krishnaayan in Gujarati.
! They were deeply immersed in the sand. The impression engraved in the sand was filled with water. 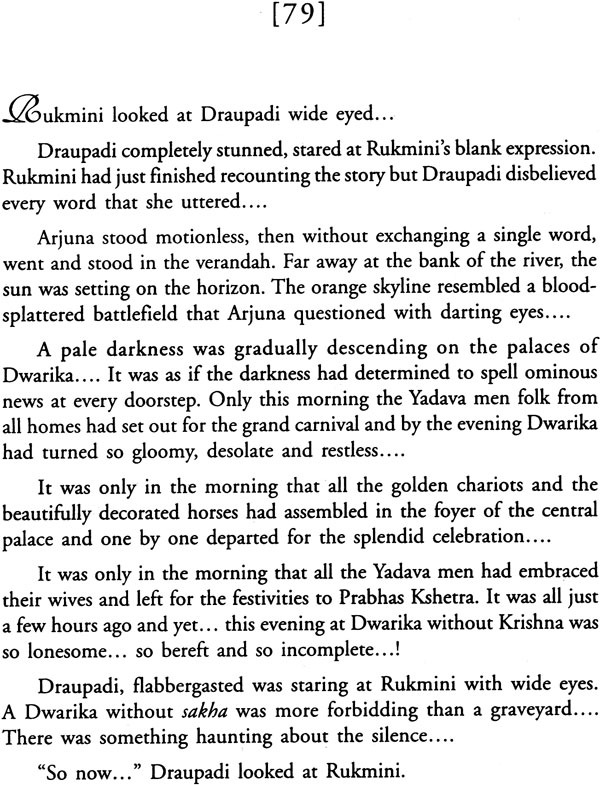 Rukmini's streaming tears were making an offering in the water-filled footprints. As if Asserting His Own Obeisance to the Great God….